The Port Manager of Kvarken Ports Matti Esko, which is owned jointly by Vaasa and Umeå, has no time to get bored at work due to his diverse job description. What makes his job even more interesting is the fact that the port company functions physically in two countries. In Finland, Esko works in close cooperation with both the City of Vaasa’s logistics unit and the Logistics Experts at Vaasa Region Development Company VASEK. His other partners include, for example, shipping companies and forwarding agencies that use the port, and the industries and trades that transport their goods through it. 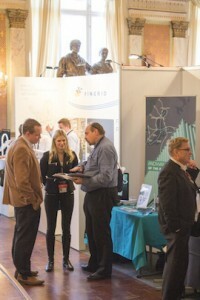 An increasing part of Esko’s job involves marketing of the Kvarken Ports at trade fairs and other events. He is also involved in several collaboration teams working with logistics. With Logistics Expert Riitta Björkenheim, Matti Esko goes through the meetings they will both attend and issues they will deal with in the near future. Esko meets with VASEK’s Logistics Experts every week, because improving logistics in the Vaasa region has been VASEK’s strategic development project since 2007 and a great deal of work has been done also to improve Vaasa’s port. One of their most important joint development projects right now is the EU-funded Midway Alignment of the Bothnian Corridor, which aims to create a complete logistics solution for traffic in the Kvarken. As the infrastructure of the port is being developed, the region’s industrial companies still hope that they will one day have a weekly freight service to Central Europe. The situation changes constantly, so a previous failure does not rule out the need for freight service in the future. Monday 17 Aug. 2015 at 7:45 p.m.
On Monday evening, Wasaline’s Conny Södergård performs the check-in and Matti Esko drives on board m/s Wasa Express with all the other passengers. On Tuesday morning, there will be a strategy workshop for the staff in Umeå. This won’t be the only meeting of the day, because many large investments are being made in Umeå’s port regarding the terminals and the road and rail connections. The development of multimodality is progressing well in Umeå and customers can choose different forms of transport for their freight in the port. The diverse connecting services from Umeå also give the customers in Vaasa the opportunity to choose between different transport modes for their freight from and to Umeå. Thursday 20 Aug. 2015 at 9:30 a.m. The strategy of Kvarken Ports is being developed as a whole on both sides of the gulf. On Thursday morning, the staff gathers in the port office to consider their own comments on the strategy work before handing them over to the company’s Board of Directors. What would be a more suitable expert group to comment on the SWOT analysis, future customer potential and growth possibilities of the port than the staff! Friday 21 Aug. 2015 at 10:00 a.m. 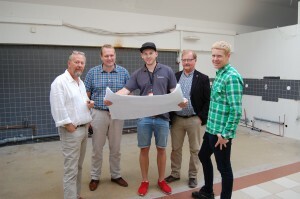 In the port’s passenger terminal, Matti Esko and Traffic Manager Kristian Mäki-Jussila meet The City of Vaasa’s Logistics Developer Teijo Seppelin, Wasaline’s Managing Director Peter Ståhlberg and Maunu Ylimäki, who represents the building firm Rennova. The purpose of the meeting is to discuss the modernisation of the passenger terminal, which is due to be finished by the end of the year. The office of Kvarken Ports will also move to the passenger terminal. Kvarken Ports is a company that has united the ports of Vaasa and Umeå and works to develop their position in the Baltic traffic. The City of Vaasa and the municipality of Umeå own the real estate in the ports and their infrastructure and rent them to Kvarken Ports, which handles port functions with the help of its partners.